Here's an updated image of the M7 area, which may be contrasted with an image from 10 years ago further down the page. Messier object number 7 (Ptolemy's Cluster) is one of the best binocular clusters in the sky. It's at the tail of Scorpius the scorpion, towards the brightest area of the Milky Way. 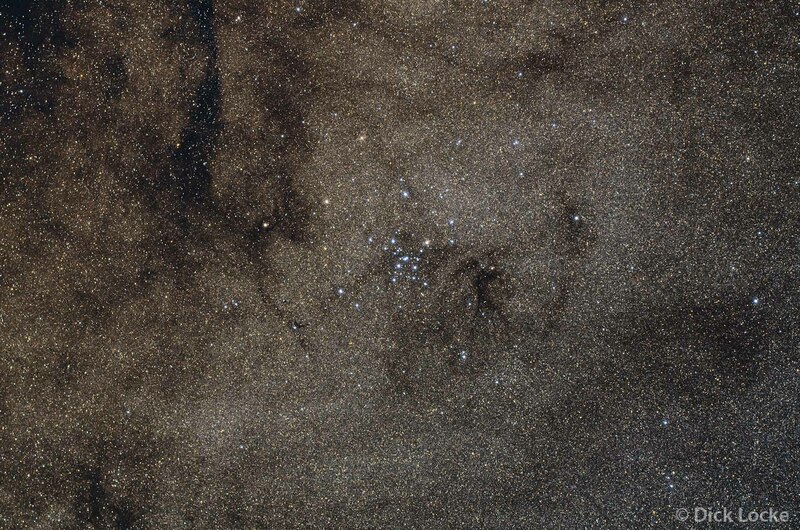 In addition to the blueish stars of the open star cluster, Barnard dark nebula B287 is just to the right, with B286 less prominent to the upper right of that. 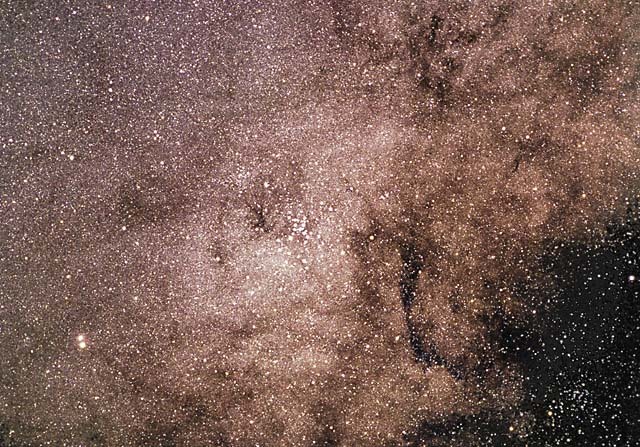 On the mid-upper-left the large dark nebula is B283, while part of B292 is seen lower left. Registar counts 103,873 stars in this frame! This is the southern-most object in Charles Messier's Catalog. There are some clusters just below this that Messier was unable to view from Paris; M7 was just a few degrees above the horizon there at its highest. See some nearby objects on my 3/25/06 Southern Spring Skies from Texas page. I also have a wide Southern Milky way page worth seeing. A prime focus M7 image through the TOA and Nikon D810A is in progress. Registar finds 41,956 stars in this frame. Whoa! I'd hate to try to count those by hand... Note dark nebula Barnard 287 (B287) below and just to the left of the cluster; you can also see part of a much larger B283 on the upper right. Image Details: 8x4 minute exposures on 3/25/2006 at HAS site near Columbus, TX, USA. Canon EOS 20Da (unmodified), Takahashi TOA 130 (a 5" APO refractor), Losmandy G-11 mount. My image processing workflow is here. The table below shows some of my previous efforts at M7. M6 is nearby, and shown here. 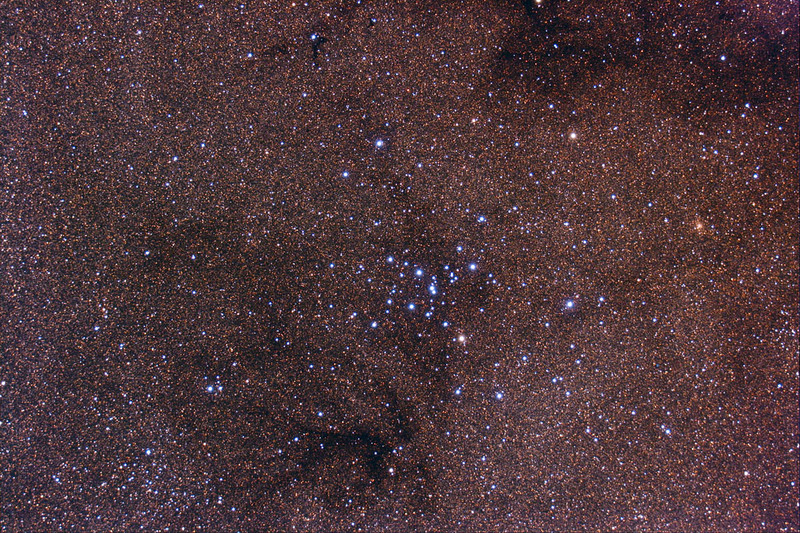 M7, Open Cluster Near Scorpius (old version) Left image from 2004 taken in the Davis Mountains, Texas. Dark Nebulae are visible: B287 just to the left of the middle cluster, B283 is to the right and down from the cluster, and perhaps B87 on the mid-upper-right part of the picture.